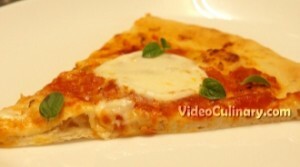 A simple recipe for thin crust Italian Pizza topped with tomato sauce, Mozzarella cheese and basil – from scratch! 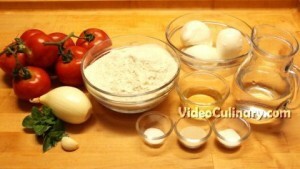 Make the pizza dough: Sift 500 grams (18 oz) of flour into the bowl of a stand mixer. Add 0.5 teaspoon of salt, a teaspoon of sugar, and two teaspoons of instant dry yeast and mix well. Gradually add 300 ml (10 fl oz) of room temperature water. 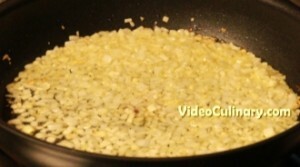 Mix for 2 minutes and add 50 grams (2 oz) of olive oil, or any other vegetable oil. Knead the dough for 8 more minutes. 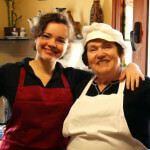 You could knead the dough by hand too – it will take longer but you will get an arm workout. Finish kneading the dough by hand on a lightly floured surface. Shape into a round, place in a large bowl. The bowl should be at least 4 times bigger than the dough. 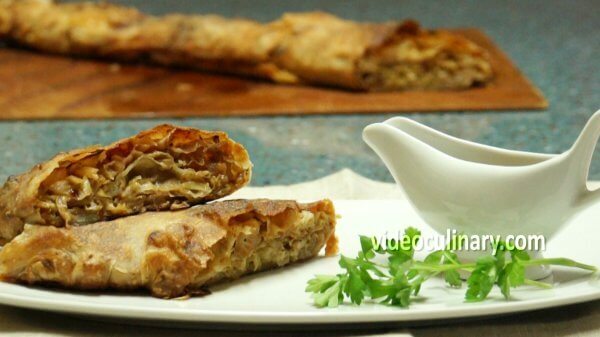 Cover with plastic wrap and let rise at room temperature for 1.5 hours. 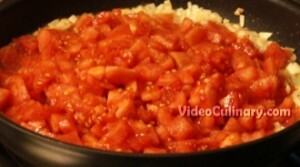 While the dough is rising, make the tomato sauce: Peel, wash and medium dice a large onion. Crush one clove of garlic. Peel the tomatoes: use a sharp knife and make a crosswise incision. Place in boiling water for 20-30 seconds, and place in ice water. 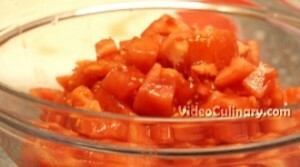 Remove the skins easily, core and cube the tomatoes. Heat 50 grams (2 oz) of olive oil in a thick-bottomed sauté pan. 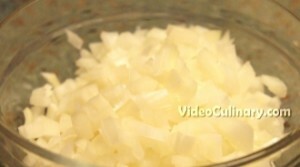 Fry the onions until translucent, add the garlic and fry for another minute. 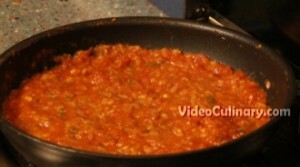 Add the tomatoes, mix, add a teaspoon of salt and half a teaspoon of ground black pepper. Simmer over low heat for about an hour, stirring from time to time. Add a little bit of water to the sauce while cooking if necessary. Mince a few leaves of basil; add to the sauce and mix. Turn of the heat and cool the sauce. 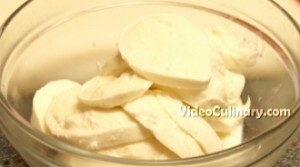 Slice 350-400 grams (about 13 oz) of mozzarella cheese into 4-5 mm (1/5 inch) thick slices. You can use other types of cheese (grated) to your liking. By now, the dough should rise dramatically and fill the bowl. 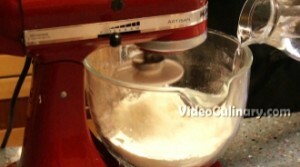 Take the dough out of the bowl and place on a lightly floured work surface. 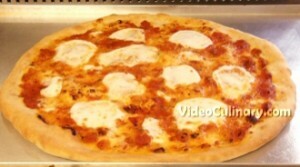 Shape the dough into a ball, and divide the dough into two balls, for two pizzas of 40 cm (16 inch) in diameter, or divide the dough into four balls, for 4 personal pizzas of about 26 cm (10 inch) in diameter. We are going to make two personal pizzas and one large pizza. 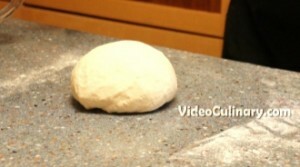 Roll the dough into a rough circle, about 4 mm thick (1/5 inch). 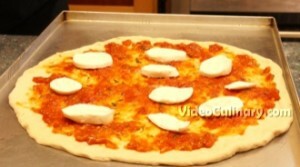 Place the pizza dough round on baking sheets lightly brushed with oil. 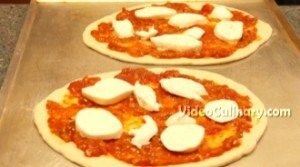 Spread half of the tomato sauce (about 250 grams) on top of the pizza dough, and arrange half of the sliced mozzarella cheese. 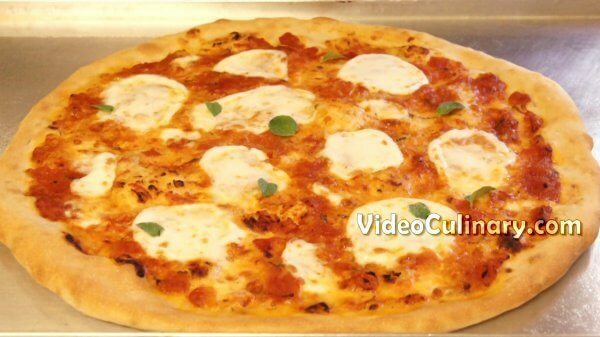 Make one or two more pizzas with the remaining pizza dough, tomato sauce and cheese. 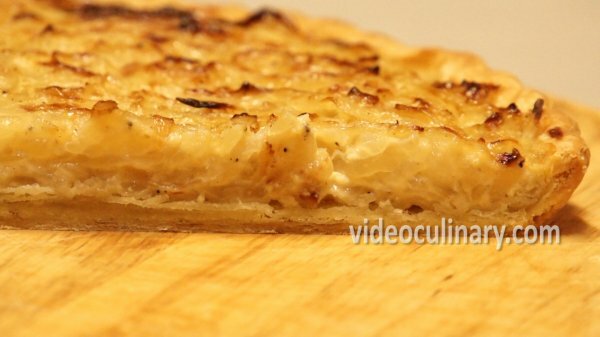 Bake in a preheated oven at 230-240°C (450°F) for 10-15 minutes. Cool for a minute, slice, serve and enjoy!